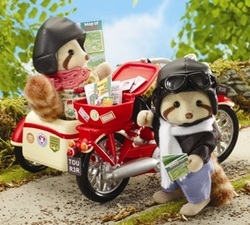 The Sylvanian Families get motoring in this old-fashioned motorcycle and sidecar with storage spaces in the front of the sidecar and the pannier at the back of the cycle. George & Mildred Mulberry are Racoon Grandparents who enjoy riding around the country lanes, he has helmet & goggles so he can see where he is going. Mildred likes to wrap up warm before they set off as it can get a bit breezy in the side car! Cute, cuddly and furry - if you like raccoons, you'll gots nuts for Zhu Zhu Hamsters!